Nathalie Brunet has fallen in love with this riad dating the end of the XVIIIth century, restored in the finest Moroccan tradition, to make our guests live the magic of Mogador. Light, calm, and comfort are the watchwords of this white dressed house. Our riad of 8 rooms and suites can welcome up to 22 persons. 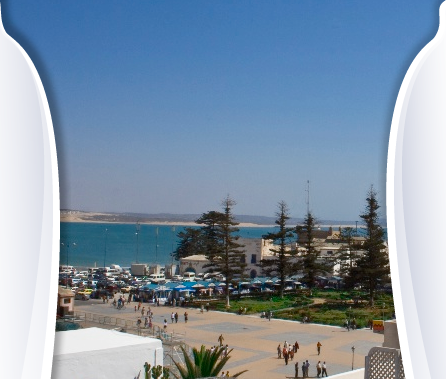 Ideally located along the ancient city walls, its terrace offers a superb panoramic view on the ocean, the port, the island of Mogador, and the Madina. Enjoy your breakfast on one of our terraces. Let yourself carry by the rumour of the ocean and the call of the seagulls on our solarium terrace. Relax by the fire in one of our living-rooms, or in the patio, by the fountain. Night watchman, laundry service and safe are available; heating in all the rooms. We speak English and French.